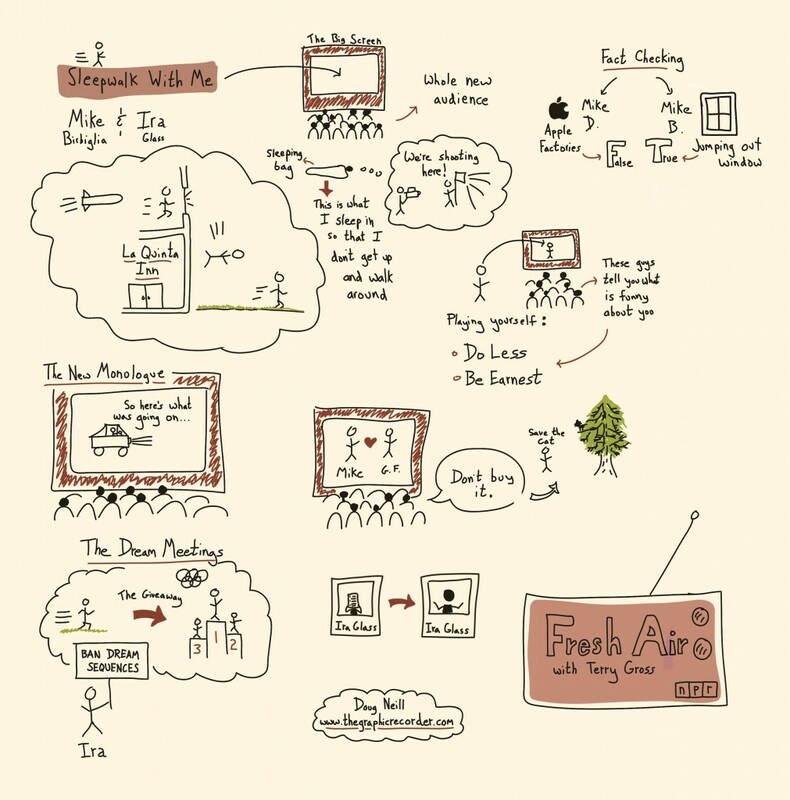 I practiced my real-time graphic recording skills recently as I listened to Fresh Air’s host Terry Gross interview Ira Glass and Mike Birbiglia about their upcoming movie: Sleepwalk With Me. Check out the sketch above to see what I came up with (you can click on the image to view a larger version). To listen to the entire interview head over to NPR’s website. I used the iPad app Adobe Ideas to create the sketch above, with a limited amount of post-editing in SketchBook Express. This was my first experience doing real-time graphing recording on an iPad, but I imagine I’ll be doing a lot more of it in the future. Though I was initially skeptical about digital graphic recording, I’ve become a quick convert because of the following features: the undo button, two taps to change colors, zooming in and out seamlessly, and layers. Also, the knowledge that I can go in and make edits after the fact makes me less nervous and self-conscious about what I sketch so that instead I can just flow with what I’m hearing. If you have experiences with digital graphic recording, I’d love to hear about them!